Over the past few years, CN’s traffic has grown significantly, which has led to a need for more trains to move this traffic. This means more locomotives and more crews. 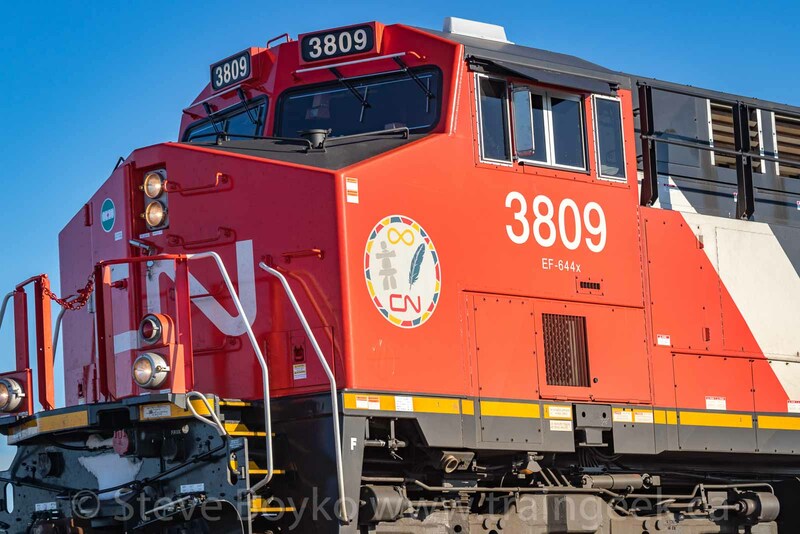 CN has been hiring and training new conductors all across Canada and the US, and they’ve been buying new locomotives and leasing locomotives as well. This article will talk about CN’s new, and “new to them”, locomotives. In late December, CN announced that they would purchase 200 new locomotives from GE Transportation. These locomotives are Evolution series locomotives (GE ES44AC and ET44AC) and are produced at the GE Manufacturing Solutions facility in Fort Worth, Texas. The locomotives were to be delivered starting in 2018 and continuing through into 2020. The first of these locomotives, CN 3806, rolled out of the plant in early June 2018. This was not the first ES44AC that CN owned. They received 22 of them (CN 2984-2999 and CN 3800-3805) starting in the fall of 2017. Presumably CN was happy with their performance! In September 2018, CN announced that they added 60 more locomotives to that order, for a total of 260 locomotives. I expect to see these new GEs a lot trackside! The crews seem to like them. CN also leased a lot of road power in late 2017 – around 100 locomotives. These included new ES44ACs from Citirail (see above), ex Santa Fe SD75Ms from Progress Rail, and a variety of locomotives from GE Capital Leasing. I’m told that a fair number of these units were “less than reliable”, but when you’re power short, you take what you can get. CN recently started returning some of these leased locomotives. The profusion of leased locomotives has been very exciting for railfans! It has been very interesting to see the variety of power on CN this past year, with many trains having at least one leased locomotive. Now that the big GEs are arriving, the leasers will go back, but it was fun while it lasted. Blog partner Eric Gagnon wrote of an earlier time when CN leased a lot of locomotives – between 1994 and 1998! CN has also started leasing some switching locomotives. I’m told they have leased around 40 blue GP38-2 locomotives from GATX. I haven’t seen any on CN, but they are the same look as the locos I saw on the Stewart Southern Railway. CN’s current switcher fleet is getting very long in the tooth. Their own GP38-2 fleet is pretty old, and judging by the look of the humpyard dogs in Symington Yard here in Winnipeg, in dire need of refurbishment. They have some GP9s remaining but they are also dwindling – and old – and most of CN’s GMD1s have been retired. 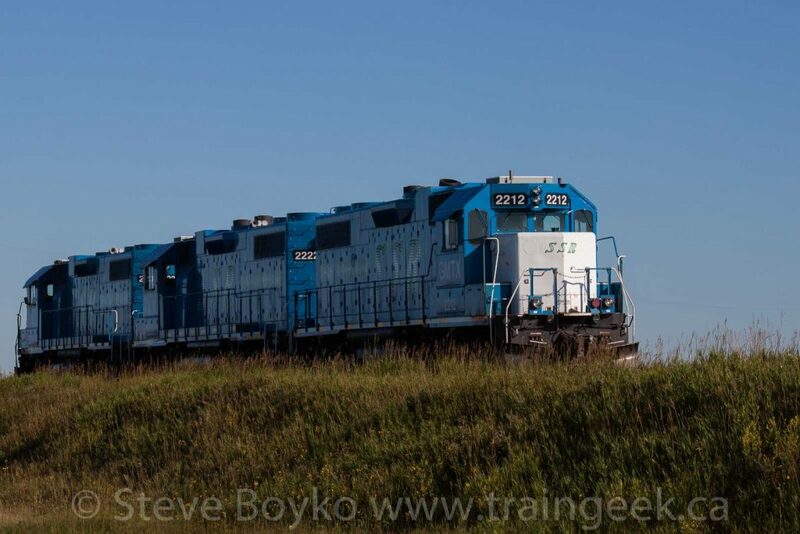 Here in Winnipeg – and elsewhere – a few SD40 locomotives have been repurposed as hump units but there aren’t many of those either. One of the major problems is that no major locomotive manufacturer is offering new 4 axle locomotives. Republic Locomotive offers their RX500, but I don’t know that they can produce enough locomotives to replace the switcher fleets of any Class 1 railway. There are plenty of companies remanufacturing existing locomotives, and I think that’s the way CN and others are going to have to go. What leased or new locomotives have you seen? What’s your favourite? My favourite of the leasers were the PRLX SD75M’s and CITX SD70M-2’s. I liked those ex Santa Fe units too! Interesting post. That would explain the recent GATX locomotive going through on the Arprior sub a little while ago. It’s CN track that only serves one industry and usually has a really weather-beaten GP38 of some sort. Is that the track to the chemical industry? I hope to see those GATX units someday but I don’t think there are any around Winnipeg. Yes, its a Nylene plant in Arnprior. It’s a once-a-week trip. Every Wednesday. About a 5.5 hour turn where I can see it. My cubical window looks out to the tracks, so I can hear and see it passing through. When I saw it go up, I made sure to be trackside (a short 10 minute walk) to grab some pictures. I make sure to have my camera with me on Wednesdays. Saw a SD60 on CP’s Carberry sub on the way to Winnipeg last week! Ex SOO with the new beaver! Looked great! One of my favorite modern diesels. If it had the new beaver, then it was probably a new SD60-3 rebuild. I like those ex SOO SD60s.